Last week's release of the Amazon Kindle Paperwhite offered an opportunity to look back on the rapid growth of e-reading, and look forward to what the digitization of publishing will mean to four major market forces: publishers, bookstores, authors and readers. As during any technological disruption, winners and losers trade fates until the upheaval settles and a new cycle of status quo begins. While industrial forces work their way through the dislocation of new paradigms, individuals -- both book consumers and book authors -- stand to be the biggest winners, and that is a good thing. I still have my first-generation Kindle. It is dead now, sitting in my museum of vintage kit. But its legacy lives on in the Kindle apps I run in all devices and computers, and, more importantly, in my altered view of reading, acquiring and owning books. Not to mention a changed understanding of what a book is in the first place. Book publishing trails behind music labels in disrupted evolution, but is inching down the same hazardous path. I haven't bought a music CD in 15 years or a physical book in five. The first Kindle was a blemished device, with drunken usability design that had pages flipping madly if you put your wrist in the wrong place while reaching for a cup of tea. Everyone who bought it after the reviews were posted knew about its grievous faults, but bought it anyway. It wasn't just the novelty of reading electronically, which many early adopters had already experienced via Project Gutenberg and other outlets. And it wasn't just about portable e-reading, though that was major. It was certainly about the ecosystem which paired the Kindle Store with the Kindle device, just as Apple modeled out with iTunes / iPod. And perhaps more than anything, it was the deal-closing Whispernet feature which enabled a spectacular level of impulse buying: Read about a new title in the New York Times book review, grab the Kindle and be reading the damn thing in seconds. In 2007, that was futurism for the masses -- just in time for the holidays. The future cost $400. In the present tense, you can buy a much sleeker and friendlier fifth-generation Kindle for $69. That price makes the device itself an impulse buy, and pushes the Kindle toward the legendary razor / blade model in which the container costs nothing and its content provides an enduring revenue stream. This was Amazon's second revolution on behalf of customers; the first was also related to platform. Amazon popularized internet book purchases in the '90s, and, crucially, created new value perceptions through deep discounts. Many people found browsing Amazon's website more rewarding than browsing physical aisles, but even those who preferred the out-of-house experience would jot down their discoveries to order later, online. The perceived value of a physical book was changing, just as the value of an e-book is now in flux. How Cheap Are Book Bits? 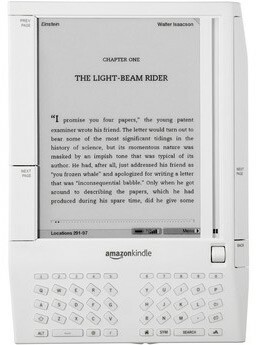 Oh yes, I forgot to mention another wowness of the original Kindle: $9.99 books. In benchmarking that price point as the default value for nearly all books in the Kindle Store, Amazon was discounting to a loss, presumably to build adoption of the Kindle platform. For the first couple of years into the Kindle era, the wholesale price of digital books was identical to the physical price -- about $12 for a new hardcover. Amazon was undercutting its own break-even point to gain traction in a new market. You might not think publishers would object to the pricing tactic. After all, Amazon had been deeply discounting physical books for years, threatening brick-and-mortar shops of all sizes with its deep pockets. Amazon was altering the perceived value of e-books just as it had with physical books, and this particular demonstration of predatory behavior worried publishers for a couple of reasons. First, publishers make more money on hardcover sales than e-book sales, thanks to the inconvenient and widely unknown fact that digital books don't cost much less to produce than physical ones. Second, because Amazon was propagating a technology platform as the front end of a book ecosystem, publishers feared a future monopoly in which Amazon controlled the market to such an extent as to control wholesale pricing and other business terms. There was another unhappy emergent player: Apple Inc., whose new iPad represented a competing e-book purchase and reading platform. Sometime in 2009, something happened. It might have involved Apple and several major publishers working together to solve perceived competitive inequity. Facts are murky and disputed, but by the end of 2009, Apple and five of the Big Six publishers (Random House being the outlier) had agreed to new business terms that overthrew the traditional wholesale model. In the wholesale model, bookstores could determine their own prices and margins based on a steady wholesale price of roughly 50 percent of retail. In the new arrangement, called the "agency model," the publisher set the retail price and the bookstore agreed per contract not to discount. 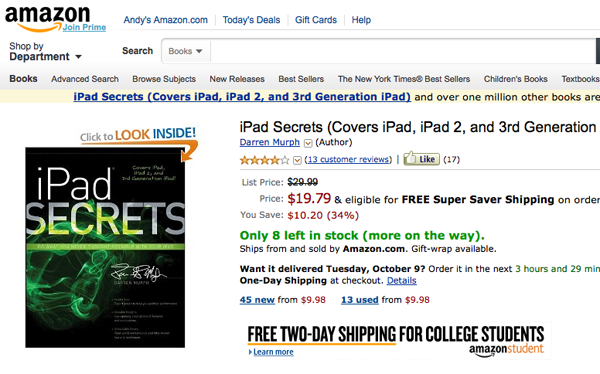 All active e-book customers noticed the price jumps in Amazon, which was forced to comply. There is nothing wrong with any distribution terms negotiated between a vendor and an outlet. But a collective agreement meant to set broad market conditions crosses antitrust lines, and the Department of Justice sued Apple and the five publishers in April of this year. To fend off Amazon's potential monopoly power, Apple and publishers might have manufactured their own monopoly mojo and forced Amazon into their world. In the same week as the release of the fifth-generation Kindle (the $69 model), three of the antitrust defendants settled the suit, agreeing to dismantle their agency model contracts and revert to standard wholesale practice. (Apple, Macmillan and Penguin are still litigating.) The same customers who grumpily paid 12 to 16 dollars per book will presumably (but not necessarily) see prices for some books revert to a bargain level. Regaining its pricing freedom is a huge, if partial, cost-free win for Amazon. Readers are also, again, winners. If the historical role of publishers as talent scouts, investors and gatekeepers of quality is losing relevance, indie success stories such as Amanda Hocking establish the legitimacy of self-publishing ever more securely. Entrepreneurial writers can do more than Amazon in changing perceived value -- Hocking's prices in the Kindle Store range from one dollar to 10 dollars, with many titles at $2.99. She has earned over $2 million. Premium publishers and their best customers might view such self-publishing shenanigans as a side alley. Detractors point out that for every Hocking there are uncountable self-published authors making pennies. But that is merely, and greatly, the story of internet startup, and the story of connecting creators directly with consumers. Increasingly, and I believe this trend will accelerate, traditional publishers appear as roadblocks, not enablers. "Getting signed," in publishing as in music, is ever more quixotic and unnecessary. Amazon plays aggressively as an enabler in the self-publishing space, both with e-books and physicals (where stigmas are also, more slowly, eroding). Amazon provides comprehensive conversion and production tools that can create book products inexpensively and place them into a huge market instantly. That is powerful stuff, and the reduction of book publishing to glorified blogging is surely alarming to publishers with their huge editing, manufacturing and marketing overheads. Creators are the obvious winners, but so are readers. Just as music lovers discover new artistic universes by prowling the self-distributed indie catalogs in Spotify, Rdio, SoundCloud, MOG or ReverbNation, so can readers begin to discover worlds of imagination in the nascent self-publishing scene. Digital overthrow is never easy for legacy power centers. But what is good for both end-users and creators will ultimately have good wash upon the industry generally. Where there is demand fueled by lower prices and instant access, there is a market. And where that market is supplied by an unlimited number of creators standing on level ground, there is enterprise at its best.